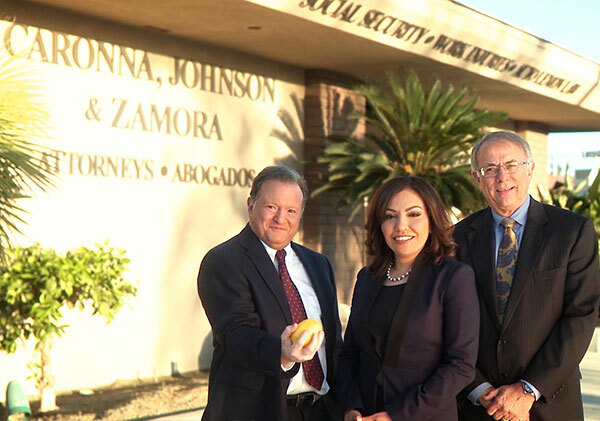 For legal counsel you can rely on and representation you can trust, clients in the Palm Springs area and throughout Southern California choose the attorneys of Caronna, Johnson & Zamora, LLP. We have earned a reputation for getting results for clients who have been injured in accidents or at work, for disabled people seeking Social Security Disability benefits, and for those who need legal representation in matters of automotive law. Our experienced lawyers have obtained more than $100 million in benefits for our clients since 1989. If we can be of assistance to you, please contact us today to arrange a free consultation and case evaluation. From our handicapped accessible offices across from the River Shopping Center in Rancho Mirage, we represent clients in the Palm Springs area, throughout California, and across the nation.